002. WITH CAPTAIN SCOTT AT THE SOUTH POLE. Issued in a series of 25 by Fry's Pure Cocoa (Date? Post 1912). Size: 2.55" x 1.4". 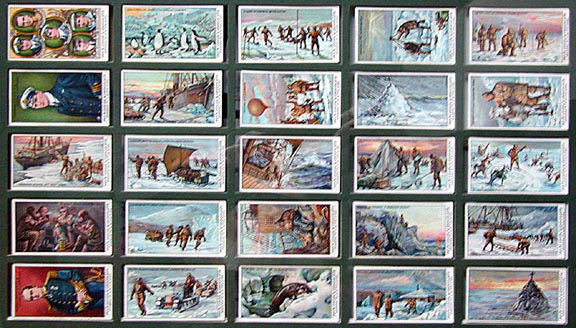 Recto: Chromolithographic images from the south polar regions and Scott's 'Terra Nova' expedition. Title is given within the image and "Fry's Cocoa & Chocolate | Makers to H.M. the King" on the short edge outside the image. 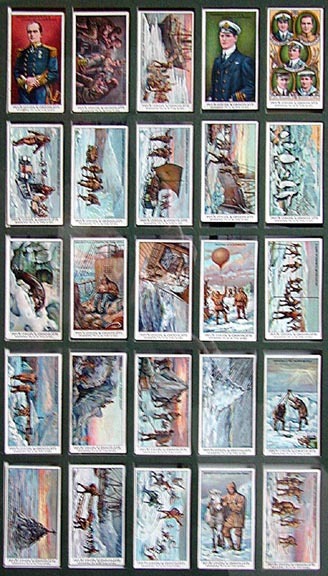 Verso (typical): 25 in Series | With Captain Scott at the South Pole | [Card number within a shield] [Description] | FRY'S | PURE COCOA | 300 Grands Prix, Gold Medals, &c.
1. Captain Scott, R.N., C.V.O. Leader of the Expedition. Captain Robert Falcon Scott, R.N.C.V.O.F.R.G.S., was born in June, 1868 nad entered the Navy in 1882. On obtaining his commission he specialised in Torpedo work, was then promoted first Lieutenant of H.M.S. "Majestic." He was made Commander in 1900 and in 1901 was selected to command the "Discovery" expedition. He was promoted to Captain in 1904, and in 1910, organised the most complete scientific expedition that ever left for the Polar regions. 2. Camping--A Meal Inside the Tent. This shows a sledging party of four men enjoying their evening mug of Fry's cocoa. At the end of the day's march the cook of the party would immediately get the stove lighted as soon as the tent was pitched, and by the time the tired men had made ready for the night a grateful and comforting mug of cocoa was ready to put fresh life into their veins. 3. Unloading Stores off Cape Evans. When the "Terra Nova" reached McMurdo Sound in January, 1911, it was found to be almost completely frozen over but a channel through the ice appeared and up this she steamed until off a point afterwards named Cape Evans. After a site for the hut had been chosen, everyone set to work to land the stores, and for three weeks sledges were working between the ship and the shore. 4. Commander Evans, R.N. Second in Command. Commander Edward R. G. R. Evans, C.B., R.N., joined the Navy in Januiary, 1897. He specialised in Navigation, and as a sub-Lieutenant was lent by the Admiralty to the "Discovery" Expedition. In 1909 he bagan to organise an Antarctic dash, but hearing that Captain Scott was going again, he joined forces and sailed as Second-in-command. On his return to England he was promoted to Commander. 5. Lieut. H. R. Bowers, Captn. Oates, Captn. Scott, Dr. Wilson, Seaman Evans [5 portrait medallions]. The five ill-fated heroes of the Polar journey who now lie on the Great Ice Barrier, Captain Scott, Dr. Wilson, Captain Oates, Lieutenant Bowers, and Petty Officer Edgar Evans. Leaving the base in November, 1911, they reached the South Pole on January 18th 1912. Sickness and bad weather hampered their return and with Petty Officer Evans dead and food almost gone, Captain Oates thought to save his comrades by gallantly walking out to his death. 6. Motor Sledge Hauling Stores Across the Sea-Ice The scene depicts a motor sledge hauling its load across the ice from the base towards Hut Point and the Barrier. The series of Antarctic pictures you are publishing I consider to be most instructive and interesting. The details are wonderfully correct, and I must congratulate you on the reproduction. 7. A Sledging Party--Mount Erebus in the Distance. This is a sledging unit of four men marching on sea ice past a frozen iceberg. All the sledge parties were formed of units of four men to a sledge, so that one sledge could be detached at any point considered necessary. On each sledge was a tent, stove, cooker, shovel, instruments, fuel, and food for four men; a navigating officer formed one of the party so that each unit was independent. 8. Sledging Party Returning--After Ten Weeks Absence. A sledge party returning after ten weeks' absence on the Barrier and Beardmore Glacier. 9. Bringing Seal Meat to the Terra Nova for Food. The first consideration in the Antarctic is food, and therefore it is necessary to augment the ship's supply on every possible occasion. As a rule the seals were cut up where they were killed to save transport but in cases of hurry the whole beast would be brought along on a sledge and hauled on board with a tackle. 10. Adelie Penguins Amongst the Tabular Icebergs. The Adelie Penguins are the commonest birds in the Antarctic. 11. A Seal Cutting the Ice with its Teeth. The most frequently seen seals in Victoria Land are the Weddell and Crab-Eater. When a seal attempts to climb out of the water through an ice hole, and cannot get sufficient hold for his powerful flippers to lever himself on to the ice, he cuts deep furrows with his large incisor teeth and then gradually works out of the water. 12. Biologist Lillie Sorting the Trawl Catch. Throughout the voyages of the "Terra Nova" frequent opportunities were made to put down the deep sea trawl and dredger for the interesting fauna that abound in the Antarctic seas. In every trawl made in McMurdo quantities of large sponges were obtained, and these in most cases were covered in fine silicious spicules like spun glass. 13. The Terra Nova in an Antarctic Gale. Ships voyaging to the Antarctic have to cross through the famous "roaring forties" and "howling fifties," and it is seldom that a ship has managed to go from the latitude of New Zealand to that of the Antarctic Continent without experiencing heavy weather at some part of the voyage. 14. Testing Air Currents. In order to obtain as complete a cycle of meteorological records as possible it was most important that something should be known of the directions and temperatures of the upper air currents. Small balloons were sent up with recording instruments. These were detached by the action of a slowmatch and floated to the ground with a parachute. A party would recover the instruments and note the results obtained. 15. A Game of Football on the Sea-Ice. To keep in good health during the six months' winter when it was too dark and cold for sledging operations it was necessary to have plenty of exercise. When not kept indoors by blizzards everyone was out from two till five every afternoon either exercising ponies, ski-ing, or walking, and occasionally football and hockey matches on the sea ice were organised. 16. Volcanic Eruption on Mount Erebus. Ross Island, so called after Captain Sir James Ross, is composed of four mountains, one of which is still an active Volcano. This is the biggest and is called Mount Erebus. It is continually smoking and frequently small eruptions take place, when great volumes of smoke and felspars pour out of the crater, no lava flow has ever been seen, though the land round C. Evans is composed of old lava. 17. Scaling an Iceberg--A Perilous Ascent. One object of the Expedition was the study of Glaciation and ice structure. 18. Sledging Party Camping--The Sleeping Tent. Camping for the night. Immediately on finishing a day's march the four members of the sledge team would unpack the sledge as quickly as possible. First the tent poles would be erected over the floor cloth and the tent spread over them. Large lumps of snow were then dug up and placed round the skirting of the tent to weight it down. 19. Cairn Erected to Captain Oates. After finding the last camp of Capt. Scott and burying their remains the search party went on to look for the body of Capt. Oates. This they never found but erected a snow cairn near and in this placed the following inscription: "Hereabouts, died a very gallant gentleman, Capt. L. E. G. Oates, Inniskilling Dragoons, who, on their return from the Pole in March, 1912, willingly walked to his death in a blizzard to try and save his comrades, beset by hardship." 20. Hauling up the Water Bottle. In order to study the variation of marine life, samples of water from different depths are examined under the microscope. In this picture we see the biologists lowering a patent bottle down through a hole in the ice. A tripod has been erected over the hole and the bottle, &c., is lowered by means of a wire leading from a drum over a pulley. A meter on the drum shows the depth reached. When low enough a weight is sent down which seals the bottle. 21. Cairn Erected to Captain Scott, R.N. & and his Companions. When the search party found the last camp of the Polar party they collected the records and then covered the remains, and held a burial service. A cairn was erected, and on this the following record was left: "This Cross and Cairn erected over the remains of Captain R. F. Scott, C.V.O., R.N., Dr. E. A. Wilson, and Lieutenant H. R. Bowers, R.I.M. Also to commemorate their two gallant comrades, Captain L. E. G. Oates and Petty Officer E. Evans." 22. Landing Sledges at Glacier Tongue. The first year the "Terra Nova" landed the main party, she was taken later alongside the "Glacier Tongue" to unload stores for a big depot of food. At its edge to which the "Terra Nova" is moored by wire hawsers, the surface of the "Tongue" is some 8 or 10 feet above water level, and thus it forms a convenient place to "land" stores for sledging. 23. Mr Mears [sic] in Charge of the Dogs--Feeding Time. The dogs used by the Expedition came from Siberia. They were fed once a day in the evening. They would never work after being fed, but always wished to lie down and sleep off the effects of the meal. The usual ration was 1-1/2 to 2 biscuits per day, occasionally they were treated to seal meat, or pony meat as those poor beasts were shot. 24. Captain Scott & his Siberian Pony "Nobby". Pony transport was first tried by Sir Ernest Shackleton in 1907. Of the nineteen on the "Terra Nova," two died on the voyage, the remainder were landed in good condition. Eight were taken away in January 1911 and three of these returned. During the winter each member who was to lead a pony in the Polar journey took personal care of his beast and exercised him every day. 25. Captain Scott at the Pole--Taking Records. The South Pole was reached by Captain Scott on January 18th, 1912, the position was determined by theodolite. The elevation of the sun at the Poles is so slight that sextant observations might not be sufficiently accurate. The party spent two days at the Pole correcting their positions and wrote their letters before starting the long marwch than ended so tragically.